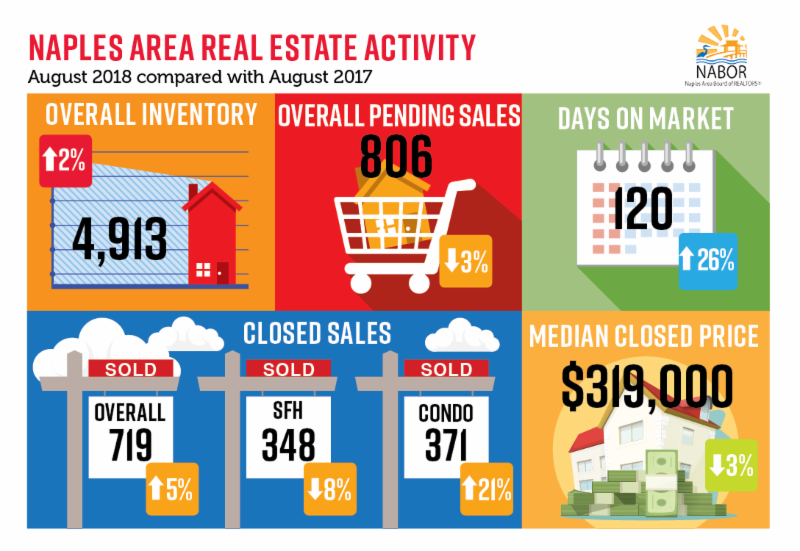 Naples, Fla. (September 14, 2018) – Closed sales of properties during August increased 5 percent to 719 homes from 685 homes in August 2017 according to the August 2018 Market Report released by the Naples Area Board of REALTORS® (NABOR®), which tracks home listings and sales within Collier County (excluding Marco Island). Inventory during August also rose by 2 percent and was driven by a surge of 218 more properties added to the market in the two lowest price categories reported, compared to August 2017. Hughes went on to point out that the majority of the new inventory in August appeared in the single-family home market for properties below $500,000. Yet interestingly, closed sales during August were driven by activity in the condominium market, which experienced a 21 percent increase. According to Jeff Jones, Managing Broker for Engel & Völkers Naples and Bonita Springs offices, “If you look at year over year numbers, the upper end continues to drive our market.” As such, pending and closed sales of properties above $1 million increased by double digits, year over year ending August 2018. Overall pending sales in August fell 3 percent; but pending sales of condominiums in the $500,000 to $1 million price range soared 28 percent in August. And pending sales for single family homes above $300,000 increased as well, with an impressive 62 percent increase for single family homes in the $2 million and above price category. Overall median closed prices fell 3 percent in August to $319,000 from $328,000 in August 2017, and it fell 13 percent for properties above $300,000 to $446,000 from $510,000 in August 2017. The only place prices increased was in the $500,00 to $1 million condominium market, which saw a 13 percent increase to $672,000 from $595,000 in August 2017. Geographically, the median closed price increased 16 percent for homes in the South Naples area. This increase was reflected in a combined 37 percent increase in the single-family home market and 21 percent increase in the condominium market. If you are looking to sell a home in Naples, contact The Wakelin Team as we have the experience and knowledge to provide an accurate market comparison so you can determine the right asking price. We can also ensure your next purchase in the Naples area is a success.